Here you can learn how to use how to use fundamental and technical analysis in order to trade binary options. There are two main types of analysis concerning the financial markets – fundamental analysis and technical analysis. We’ve touched on the subject of the difference between the two – technical analysis goes after empirical data and studies price fluctuations in an attempt to spot trends and predict future movements, whereas fundamental analysis observes economic factors and tries to determine value based on those factors. However, let’s look at more details and compare the two schools of thought more thoroughly. At the lowest level, the difference between the two types of analysts is that a fundamental analyst would start with a financial statement, whereas a technical analyst would always go for the charts. 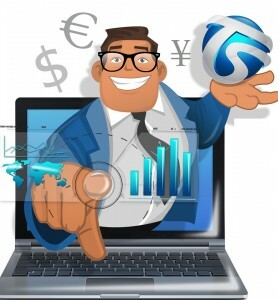 The fundamental analyst endeavors to compute an approximate value for a company based on different sources of information, such as cash flow statements, balance sheets, financial statements and more. By determining the intrinsic value of the company using this approach, it’s fairly easy to make financial decisions. If the stocks are sold at a price lower than the intrinsic value, then it’s a good investment and if the stocks are sold at a higher price – it’s a bad investment. As far as technical analysts are concerned, though, most of the actions related to calculating the intrinsic value of the company are a waste of time. As far as they are concerned, the only thing that matters is the stock price. They are only interested in empirical data and consider that all the information they would need about the stocks can be found in the charts. Technical analysts don’t concern themselves with value – for them, money talks. By looking a chart, they expect that the past price movements can indicate different trends and can predict future price movements. Another big difference between the two types of analysis is the time frame. Where fundamental can involve the processing of data over a number of years, whereas technical analysis can work with information in the range of a few minutes. This obviously means that fundamental analysis has a long-term nature, whereas technical analysis can be used in the short-term. There are a few reasons for this difference. The most significant one is that fundamental analysis focuses on the long-term because of the investment style it complies with. The trades and investments based on the intrinsic values of a company are not reflected on the market immediately. This means that even if there are some changes, they aren’t as fast and dynamic as price fluctuations, for example. Hence, fundamental analysis isn’t bound by those short-term changes. This sort of investing is called “value investing”. It’s a long-term investment method entirely based on the premise that short-term investing is wrong. There is another factor making it impossible for fundamental analysis to be conducted in a short-term window. The information and different statements fundamental analysis works with isn’t released frequently at all. For example, financial statements are released quarterly. Now, compare that the price differences of the stocks that can be observed all the time and you can easily see why the difference in time frame is there. Where technical analysts can work with stock data generated all the time, fundamental analysts work with information released at much bigger intervals. Another big difference between the two types of analysis is the objective. Technical analysis is based on short-term empirical data and is mainly utilized in trading. Fundamental analysis aims at assisting in the investment department at a much grander, long-term scale. The aim of a trader is to purchase an asset in order to later re-sell it a greater price, thus making a profit from the difference. This is short-term process. On the other hand, an investor looks for assets he believes will rise in value as time progresses, and makes the purchases based on that premise, fully aware that this process may take a long time and has long-term consequences. It may sometimes be difficult to understand what the difference between trade and investment is (the line between the two is rather thin) but this is one of the main aspects differentiating between fundamental and technical analysis. Now that you have a better understanding of the difference between these two types of analysis, in subsequent sections we will focus more on the introduction of technical analysis.